My relationship to Transformers is not infused with any nostalgia for the toys I used to play with as a kid. Nor is it steeped in reverence for the animated 1986 film, most famed amongst cinephilies for featuring Orson Welles final on-screen performance. I'm coming at these films purely as movies. 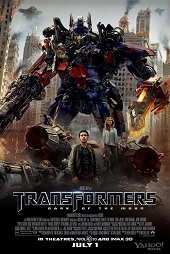 As movies, 2007's Transformers and 2009's Transformers: Revenge of the Fallen are mostly junk, though in comparison to the bloated, downright offensive sequel, the first film is an enjoyable expression of director Michael Bay's overblown style of pornographic excess. It's true that Fallen's script was crippled by the 2007-2008 writers' strike, but that didn't make the result any less repellant or perfunctory. The savage critical response to that film seems to have been headed by Bay and screenwriter Ehren Kruger. Transformers: Dark of the Moon features actual storytelling, and even when it knuckles down for what seems like endless transformer-on-transformer carnage in the epic climax, it's all refreshingly coherent. Part of what makes the story work is the script's clever retooling of the 1960s space race as something critical to Transformer-lore (X-Men: First Class did something similar for superheroes - and better - with the 1962 Cuban missile crisis). A prologue reveals that Neil and Buzz found more than just Moon dust when they stepped foot on our closest neighbour, and the crashed Cybertron spacecraft hidden on the darkside of the moon becomes a pivotal plot point. Furthering the real-world connections are a giant snake-like, tunnel-boring robot, who's sleeping in the irradiated ground zero of Chernobyl disaster, and the archival-footage-assisted appearance of three real-life presidents (our frantic hero, Sam Witwicky (Shia LaBeouf), even gets a medal from Obama for his antics in the first two movies). These elements ground the film before it springs off into the more ridiculous and far less interesting Transformers mythos. Once again at the centre of the ongoing conflict and between the Deceptions and Autobots is the heroic Optimus Prime, the evil Megatron, and a newly reactivated Sentinel Prime (voiced by Leonard Nimoy). Luckily, Kruger's script also gives the thin human characters unique characteristics, and an impressive assortment of supporting actors gives the film a welcome boost. There's LaBeouf as Witwicky, who's sharing a swish apartment with his gorgeous model girlfriend, Carly (British model Rosie Huntington-Whiteley, replacing Megan Fox), but is struggling to find work. There's Carly's boss, a smarmy Patrick Dempsey; Frances McDormand as a rock-hard government official; John Malkovich as an idiosyncratic businessman; John Turturro hamming it up as Agent Reggie Simmons; and, in the most inspired bit of casting in the film, an hilarious Alan Tudyk as Simmons' German sidekick and tech-whiz. What doesn't work is Ken Jeong (The Hangover), whose comic-relief schtick misfires. Jeong is a talented comedian - see Community - but here he's totally out of place. Despite all these characters, there's virtually zero emotional payoff in the climax for the humans, who are largely reduced to cannon fodder as the Transformers battle to take control of a burnt-out Chicago. Huntington-Whiteley, a first time actress, is the obvious weak link of the cast. Devoid of personality but gifted with a photogenic frame, Bay's camera leers at her with all the finesse of a Victoria's Secret commercial. It comes at no surprise, then, that he cast her after directing her in, well, a Victoria's Secret commercial (only Bay could work in helicopters and explosions into a lingerie ad). The real reason to see a Transformers movie is for the action. And if ear-splitting, overblown robot combat is what you want, Dark of the Moon delivers. The plane jumping, building-toppling climax is as excessive as you'd expect it to be, though the experience of Revenge of the Fallen and the restrictions of working with James Cameron's big 3D cameras seems to have calmed the director's nerve. The images on screen are no less busy and over-saturated than usual, but Bay's direction here seems comparatively restrained, and as a result, the experience of watching it in 3D is actually not eye-tearing or headache-inducing. The picture is bright, and good use is made of the negative depth in the frame. From a 3D and special effects standpoint, Dark of the Moon is incredible. Almost photorealisetic, the integration of the CGI with the (plentiful) real live elements, is simply staggering. Say what you want about the vapid content of Bay's films, but as a director he clearly has a natural technical capability and a knack for pacing and editing. Less successful is the overbearing sound mix and Steve Jablonsky's atrocious score. A watered-down, noisy ripoff of Hans Zimmer's The Thin Red Line, The Last Samurai and The Dark Knight, the music in Dark of the Moon is the worst kind of manufactured contemporary trash that expresses everything that is wrong about modern film music. It is offensively bad. Overall Dark of the Moon is about on par with the first Transformers. Benefiting from a reduced scope, it has a decent story with some clever ideas, action that's obscenely over the top but never confusing, and a bunch of character actors getting a nice paycheck. Shave 30 minutes off the run-time, and excise the ridiculously cynical method of product placement (there is literally an on-screen video ad for Mercedes! ), and Dark of the Moon might have even been Michael Bay's second legitimately good film.